The Movistar Team (UCI Team Code: MOV) is a professional road bike racing team that took part in the UCI Tour and achieved 13 Grand Prix (GC) wins at Grand Tours. The title sponsor is Telefónica, a Spanish mobile phone company whose team is known under the company's brand Movistar. Movistar cycling jerseys features a comfortable and soft fabric to bring a better experience for cyclists. 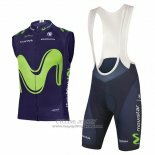 We have the latest and most popular cycling suits, welcome to buy Movistar cycling jerseys.